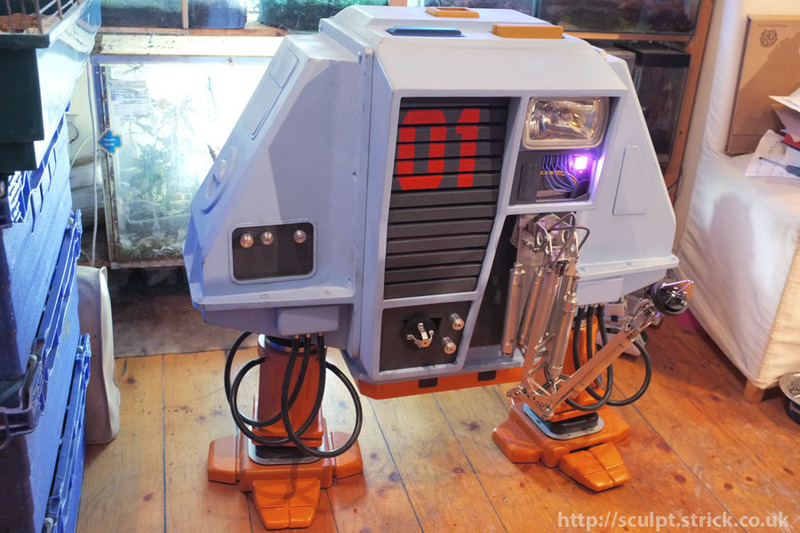 A 1:1 scale replica of the lead Valley Forge maintenance drone from Silent Running, a science fiction film made in 1972 with a strong 'green' message which feels quite relevant today. 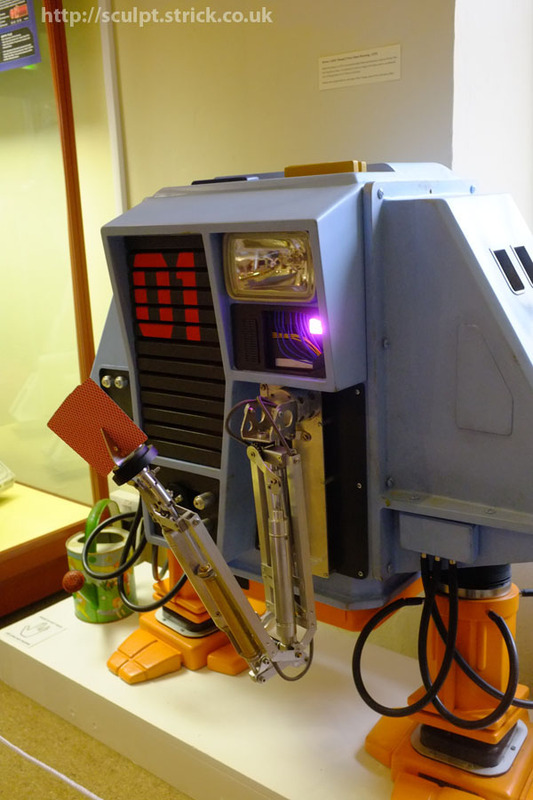 The three maintenance drones in the movie were particularly innovative as they were benign, non-humanoid, non-vocal robots that still came across as unique characters. As such they are very clearly the direct inspiration behind R2D2 and the other droids in Star Wars, which was released five years later. I produced my 1:1 rendition of Drone 1 for a museum sci-fi show. I started with the arm as I figured that was going to be the most complex element. In the end, it did represent about half the total build time for the entire drone. For much of their screentime, the Drones actually have static, dummy arms but for several key scenes they sport fully functional pneumatic limbs. Director Douglas Trumbull's father Donald designed the practical arms in the movie. He later went on to pioneer the mechanical and optical effects in Star Wars. 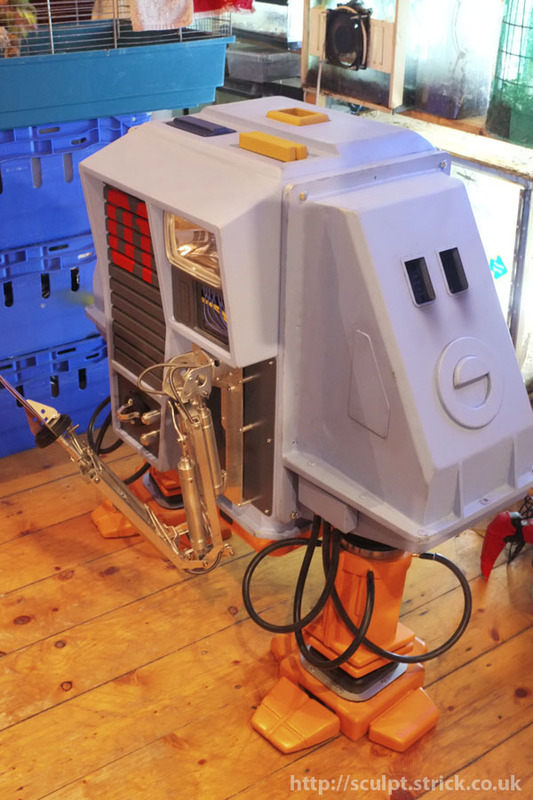 It's quite hard to make out all of the details of the arm just by viewing the film but fortunately one of the original props was auctioned in 2012 and Prop Store provided excellent photos. By comparing these pictures with screengrabs I was able to reverse-engineer the mechanism and draw up some plans. 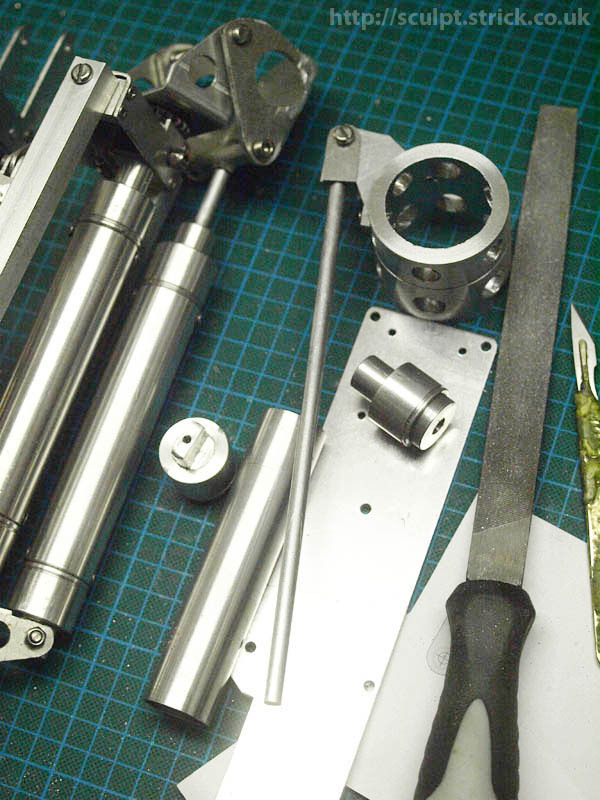 Around eighty individually fabricated aluminium and brass components went into its assembly. It was very satisfying to see that the parts on my replica interacted in the same way as those on the movie version when the arm was moved. I cheated slightly with the gears, machining down some pre-made plastic parts rather than making my own metal ones from scratch. Once painted, I don't think the difference is noticable. I did consider motorising the arm but although I established that I could fit a linear servo into the pistons, the weight of the limb would have limited movement more than would really have been worthwhile. I opted instead for making the arm as poseable as possible. Although I did see some nicely made blueprints on the Web I wasn't 100% convinced with the interpretations and decided to do my own based on screengrabs. I suspect that the lens used for filming in the restricted space of the Valley Forge sets generated quite a lot of distortion, meaning that angles and proportions on the Drones look very different from shot to shot. I calculated the dimensions for my version by working outwards from the arm, for which I had accurate measurements thanks to the Prop Store photos.The size of the drones probably shouldn't have come as a surprise given that they had to be big enough to house a human torso but once I drew up the plans I realised that they were about 50% bigger than I'd imagined from first watching the movie. 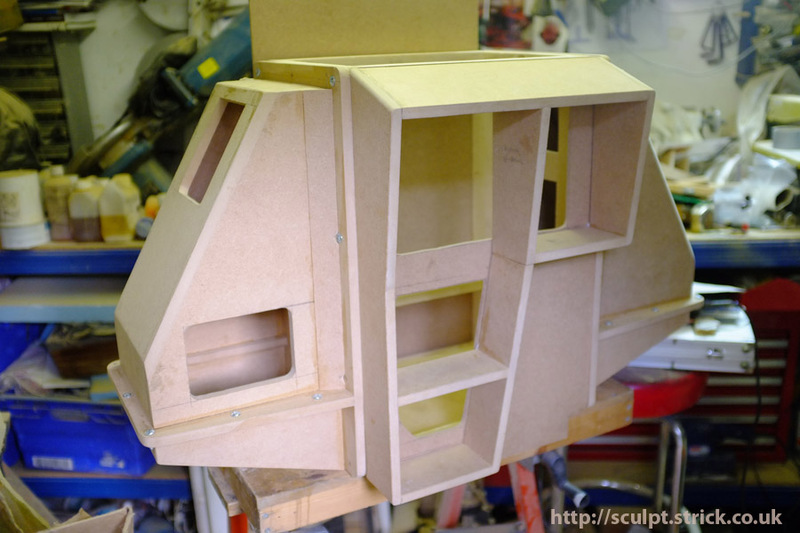 The body was made as a timber frame supporting an MDF shell. 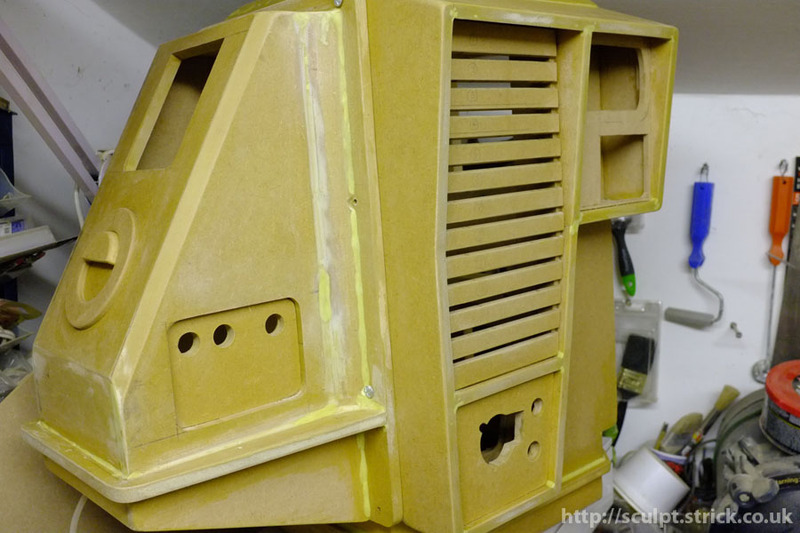 I originally intended having several parts either vac-formed or in fibreglass to keep the weight down and improve durabilty but as the time going into the build extended, I decided to cut out the extra stages. 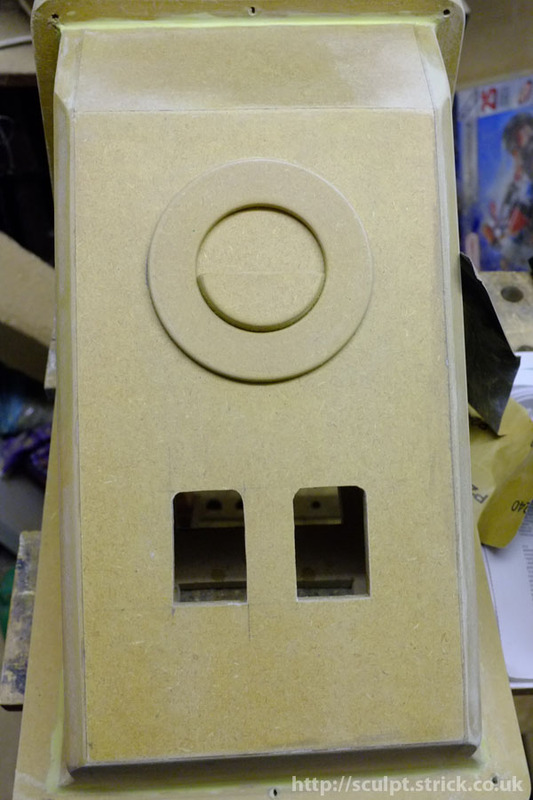 This meant spending a lot of time softening the sharp lines and joins inherent in an MDF build. It seemed to me that the riveted forms of the drones were probably in part due to the prop makers being inspired by the bulkheads and details of the decommissioned aircraft carrier on which the movie was filmed. With that in mind, I tried very subtly to suggest some weld lines and other textures found in ship construction. While not necessarily totally accurate, I felt this helped sell the look of the drone as a working piece of equiment. Although the drones' silhouette is deceptively simple, they are made up of some quite complex angles and multiple layers, probably reflecting the experimental way in which the costumes were built. 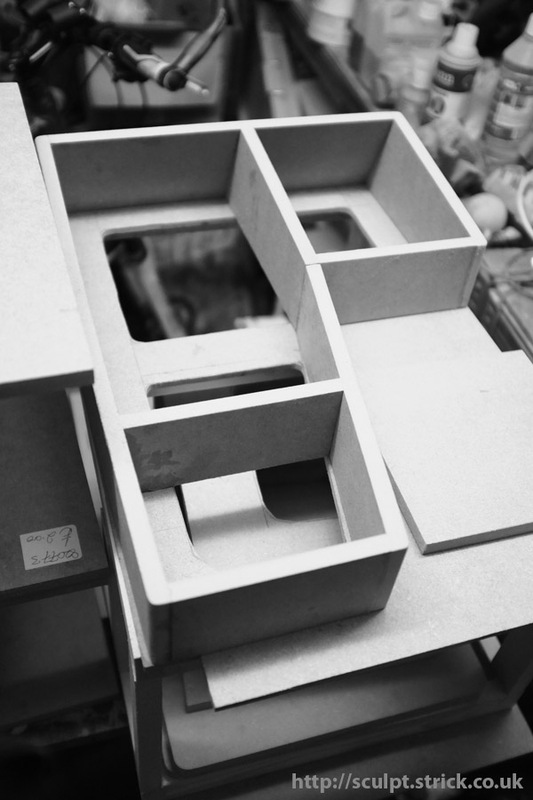 I designed the structure so that the side panels and legs could be removed for easier transport and storage. I also made as much of it hollow as possible to reduce the weight. The legs were built as sleeves that slipped over the timber support very like the actual costume. The idea was that they would sit more naturally than a screwed-together assembly. As the body came together, I gained even more respect for Mark Persons and the other the actors playing the drones. It must have been very cramped and awkward. Due to time constraints as the date of the show loomed, I had cut several corners which I will later make more accurate. 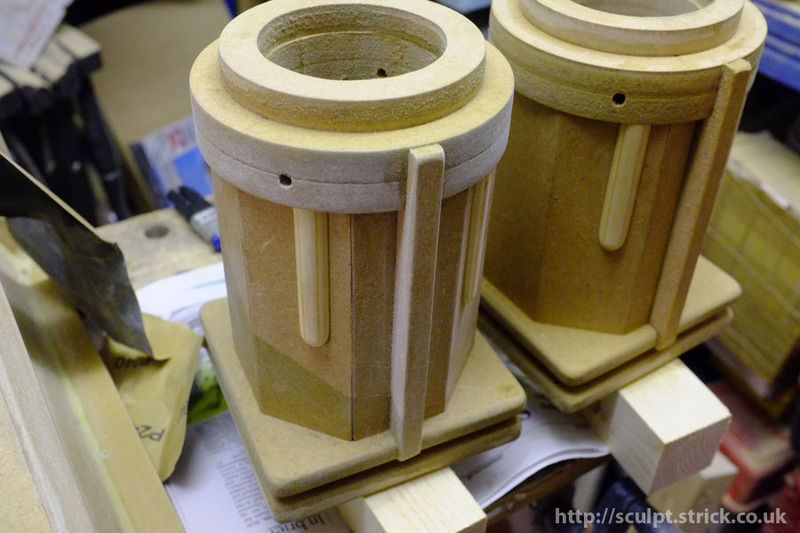 A non-curing batch of silicone caused me particular problems, forcing me to use simplified forms instead of casts of my carefully sculpted detail pieces. The fog light used on the movie props had the manufacturer's name etched into the glass in large letters. Since I was unable to obtain the exact make and model, I chose a similar unit with plain clear glass. I considered adding the logo but decided that it would be distracting and preferred it without. You have to be very careful when using found items that aren't exactly the correct dimensions as you of course need to alter adjacent dimensions to make them fit. Where you have several such parts, there's a danger that you'll end up with nothing quite lining up. As it is, some of the proportions aren't quite spot-on, but I think it looks pretty close for an idealised 1:1 model, if not for a screen-accurate replica. I used a microcontroller to run the electronics in the drone. The purple eye light cluster randomly plays a series of animated sequences which bring Dewey's face to life. 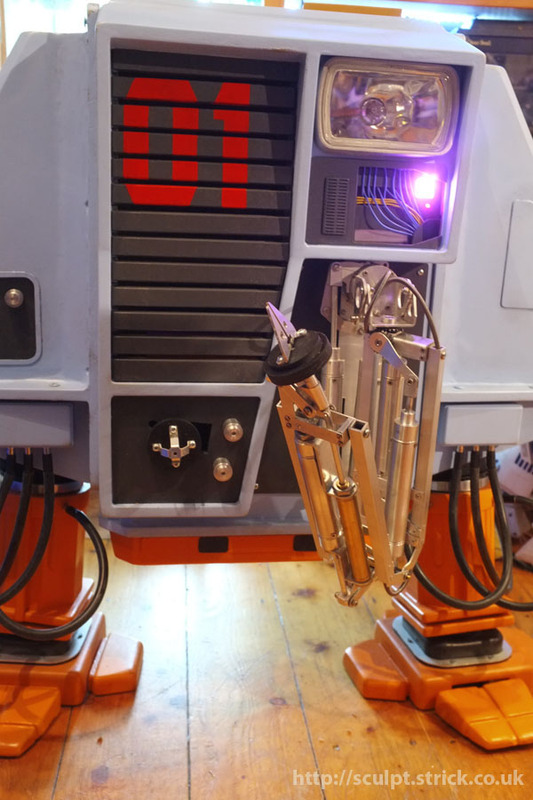 He also has a servo-driven tapping toe, as per a memorable throw-away scene in the film. The mouth and ear flaps are articulated and ready to be motorised but I ran out of time to install the actuation prior to the show, so they will be installed later. It was interesting to see the public reaction to Dewey on display. While not the best known movie, people do who remember it clearly have a lot of affection for the little drones and seemed genuinely excited to see one in person.